Far fewer people than expected turned up for a Saturday rally in central Moscow to protest the results of the recent presidential election, which saw Vladimir Putin winning in the first round with 63.6 per cent of the vote. As usual, official estimates differed somewhat from the figures provided by activists. Police say some 10,000 people gathered in Moscow’s center to protest the presidential poll, while the rally leaders have put the count at up to 25,000. Wherever the true number may lie, the protest was projected to attract at least 50,000 people. Police had even expressed readiness to halt traffic in Novy Arbat Street if the crowd could no longer fit into the designated area. Demonstrators started flocking to the venue at 12:30pm (08:30 GMT). 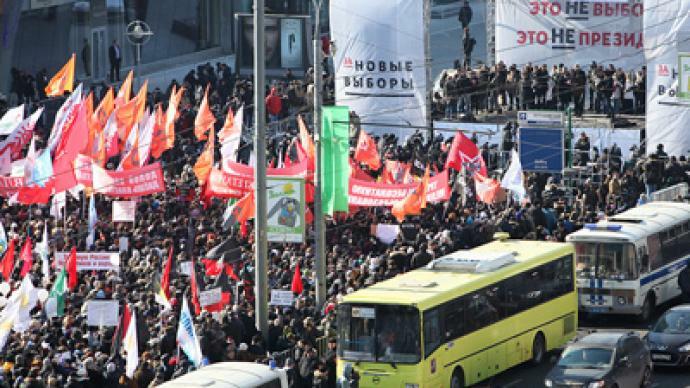 The opposition's full spectrum turned out – from the Left Front headed by Sergey Udaltsov and nationalists under empire flags to the communists and “street” independent activists, who made up the core of the December protests. Numerous banners read: “This is no president, this is no election”, “Khodorkovsky instead of Putin”, “We have seen worse instances, but never so blatant.” The signature of the movement “For Fair Elections” – ribbons, scarves and other tokens, all white – flickered everywhere. 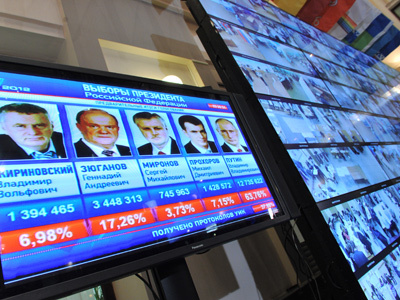 The activists believe the presidential poll was rigged with various techniques to ensure Putin’s landslide victory. In December the same, they believe, was done for the United Russia Party to scoop a majority in the lower house of the Russian parliament, the State Duma. Saturday’s rally reaffirmed the slogans created in December, transferring them onto the presidential poll: election results should be annulled; election violators should be punished; Russia needs heavy political reform; political detainees should be released from jail. “We will strive for snap elections to take place: parliamentary in one year’s time, presidential in two years,” says opposition politician Vladimir Ryzhkov. 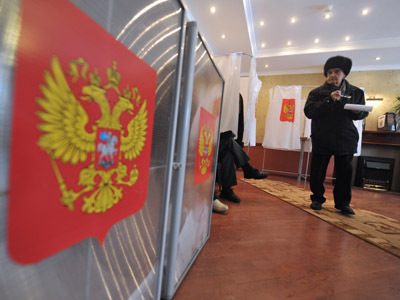 Volunteers who observed the presidential election took to the stage to tell the protesters of the violations they had witnessed at the polling stations. Ryzhkov says files will be sent to courts in 10-15 day's time. Ryzhkov also called for a new protest on May 7 – the date when President-elect Vladimir Putin will be sworn in. Leftist Udaltsov urged a March of Millions before that day. The rally wrapped up an hour earlier than it was supposed to. Police detained three people, including Udaltsov, over an attempt to stage an unsanctioned march after the rally. Explaining the lower turnout, rally leaders say it was a very good result for the third day of a holiday. Russia has been marking International Women’s Day and many will be spending Sunday at work due to calendar rearrangements. But political analysts say the movement is losing its gusto. “One million to march? No, there will be much fewer demonstrators than what we saw in winter. The opposition just does not have enough demands to conduct a protest. What can they demand? Annulling election results? 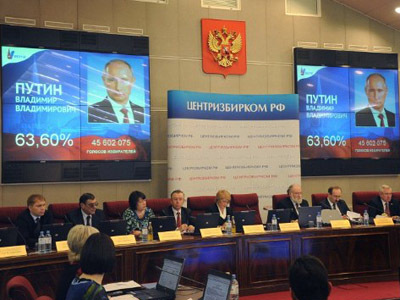 Even institutions which are clearly no fans of Mr. Putin acknowledge he has won the poll with over 50 per cent of the vote. There are no demands, and I can see no one in the opposition who could put forward any demand,” director of the International Institute for Political Expertise Evgeny Minchenko told Interfax news agency. Saturday demo follows the massive opposition rally “For Fair Elections” that took place on Monday in the Russian capital after the Sunday vote. 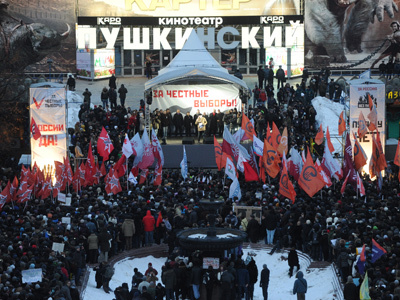 Between 14,000 and 20,000 people attended demonstrations at Pushkinskaya Square. Police briefly detained some 250 people, including Udaltsov and prominent whistle-blowing blogger Aleksey Navalny.